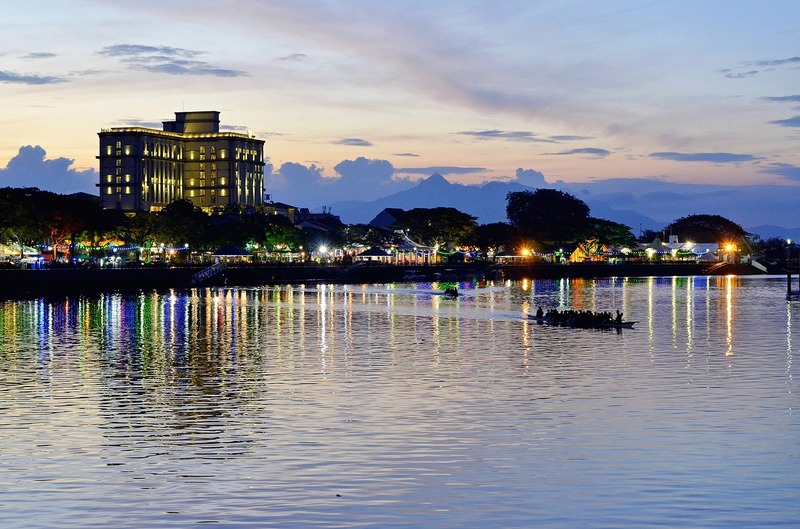 Kuching is the capital of the Malaysian Borneo state of Sarawak and your gateway to Borneo. But don’t just use it as a jumping-off point to wilder pastures. Kuching is a pleasant, compact city that makes it easy to explore on foot — and there’s much more to explore here than you might think at first glance. From the picturesque waterfront and wallet-friendly street food, to close proximity to excellent wildlife viewing, a visit to Kuching likely won’t disappoint. And to help you plan, our local Kuching tour guides have shared their best tips for making the most of your trip. The taxi is your best bet for getting to and from the airport, which lies about 10 kilometres outside the city centre. Airport taxi coupon counters can be found at the arrivals level, and one-way taxi fares from the airport are fixed at MYR 26 (MYR 39 for late-night arrivals). You can purchase a coupon at the taxi counter and proceed to the taxi stand outside the terminal. Kuching is a very walkable city and the centre is quite compact, making it possible to walk (or bike) almost everywhere. For visiting attractions outside the city centre, or when you just need a break, taxis are a decent option. Semenggoh Wildlife Centre is located just outside of Kuching (accessible by Sarawak Transport Company Bus No.6 or taxi). This is one of the best places in the world to see orangutans in their natural rainforest habitat and well worth a day trip outside the city. There are nearly 30 orangutans here and there’s a good chance of seeing quite a few during daily feedings in the rainforest. You may also see the fascinating creatures swinging above you or ambling about. For safety reasons, it’s important to stay at least five metres from the orangutans. Kuching’s scenic waterfront promenade lines along the south bank of Sarawak River and makes for a relaxing walk day or night. This is a popular meeting spot among locals and the nearly kilometre-long esplanade is home to wooden benches, vendors, food stalls, restaurants and cafés. The waterfront gets livelier at night and makes for a great spot to watch the sun go down over the river. Adjacent the waterfront, the Main Bazaar is the oldest street in the city and where you can see some examples of Chinese shophouse architecture and heritage buildings. The area is also home to several coffee shops and galleries, and offers the chance to do some browsing for souvenirs. Anyone who likes cats will have fun locating (and taking selfies) with the many cat statues in the city. Kuching means “cat” in Malay, and in addition to felines statues, there’s also the cute, kitschy Cat Museum to explore. The museum is devoted to all things feline, from photos and even more statues, to art and exhibits showcasing the history of cats in Southeast Asia. Depending on how long you’ll be staying in Kuching, a two or three-night excursion to Bako National Park is highly recommended for jungle hikes. There are numerous well-marked trails here and you’re almost guaranteed to see a variety of wildlife including the rare proboscis monkeys (found only in Borneo), long-tailed macaque monkeys, silver leaf monkeys, wild boars, squirrels and monitor lizards. The park is also home to white sand beaches for breaks in between hikes. Eat and feast like a Bornean local! Hunt for authentic local street foods along Kuching’s heritage trail, before crossing the river on a traditional boat to cycle through the Malay kampongs for more bites. There’s no better way to experience the culinary diversity of Borneo! KL is a big city with an even bigger appetite. Join a local guide on this Kuala Lumpur tour fully loaded with noodles, sweets, and coffee. By the end you’ll swear to never dine at a tourist-trap restaurant again! Experience the cultural melting pot that is Jakarta’s Chinatown. Known as Glodok, this is the biggest Chinatown in Indonesia, rich with history and steeped in tradition. With 19th century houses, ancient temples, a bustling traditional market, and famous food court, it’s truly a feast for the senses! Think of Bali, and you probably think of rice terraces cascading down the hillsides. Come see these gorgeous fields on a tour that’ll teach you the ins and outs of local agriculture. Discover an ancient irrigation system, wander through fields growing everything from rice to tomatoes, and find out how these fields are their own unique ecosystem and cultural tradition. The Sarawak International Dragon Boat Regatta is a free event every November, featuring participants from neighbouring Indonesia and Brunei and teams from villages around Sarawak. Music lovers should check out the Rainforest World Music Festival, which happens in July and has been named one of the top 25 music festivals in the world by Songlines magazine. It costs MYR 300 for a three-day pass. You can also learn more about Kuching before you go (and make plans for things to do) by taking a look at the extensive information on the Sarawak Tourism site. Get a brief taste for Kuching by watching some short videos that provide a look at some of the city’s highlights here and here. Sapeh is a traditional type of music from Kuching, which you can listen to here. A sapeh is a traditional lute of many of the Orang Ulu or “upriver people” of Central Borneo. Contact us at info@kuchingurbanadventures.com to plan your Best. Day. Ever. while you’re in town! You can also friend us on Facebook or follow us on Instagram for live updates from the ciy.